As the second post in my series of Holiday Gift Guides this 2017, I'm featuring the perfect gifts for the guys in your life (again, from independent brands). Men's items can seem so limited, it's hard to know what to get for your boyfriend, brother, fiance, dad, uncle etc. That's why I've rounded up the perfect mix of clothes and accessories so you'll be sure to find a gift for any guy on your holiday gift list. My favorites from this roundup? Life After Denim's Golden Olive bomber jacket and Le Labo's Face Lotion from their new body collection. 1. Red Wing Shoes | The perfect winter boot, beautiful constructed and versatile. 2. Throne Watches | Handcrafted in Brooklyn, this watch puts a modern twist on a classic accessory. 3. Buly 1803 | A sleek comb you can take anywhere. 4. Life After Denim | A quilted bomber with a unique color to stand out from the crowd. 5. ISM | This new tech-smart backpack is perfect for stylish guys on the go. 6. Le Labo | A lightweight yet luxurious face lotion to keep dry winter skin at bay. 7. Lightwell Co. | Cedar & Sandalwood will bring fresh, yet masculine notes to any room. 8. The Arrivals NYC | The most stunning leather gloves. 9. Deus Ex Machina | Show off his sensitive side. 10. Article One | Your new favorite sunglasses, complete with an all-flattering frame and unique pink-red lenses. 11. Away | The perfect carry-on that's both smart and durable. 12. Basic Rights | A pair of staple sweatpants that can take you from the bed to the streets. 13. Kotn | A carefully constructed sweatshirt made from the highest quality Egyptian cotton. Gifting season has begun, and every year I try to find the perfect gift for everyone on my list. While you can find beautiful items at everyday stores, it's harder to find unique pieces that will be extra special for your friends and family. This year I've centered my gift guides around independent designers. These brands not only create stunning and one-of-a-kind pieces, but are also more environmentally conscious, and even do their part to give back. One of my favorite brands from this list is Kotn — they source their extraordinary textiles ethically in Egypt, and are partnered with an organization there to build schools. So while you're shopping this holiday season you can find gifts that not only bring happiness to their recipients, but also to those who make them. 8. Anthropologie - when was the last time you found your keys easily in your bag? When it's 100 degrees out, I hate going clothing shopping. Everything sticks to you, leaving you wishing you were at home on the couch wearing as little clothes as possible, doing absolutely nothing. So my approach to summer dressing will be just that — minimal coverage with just enough accessories to look effortlessly cool. 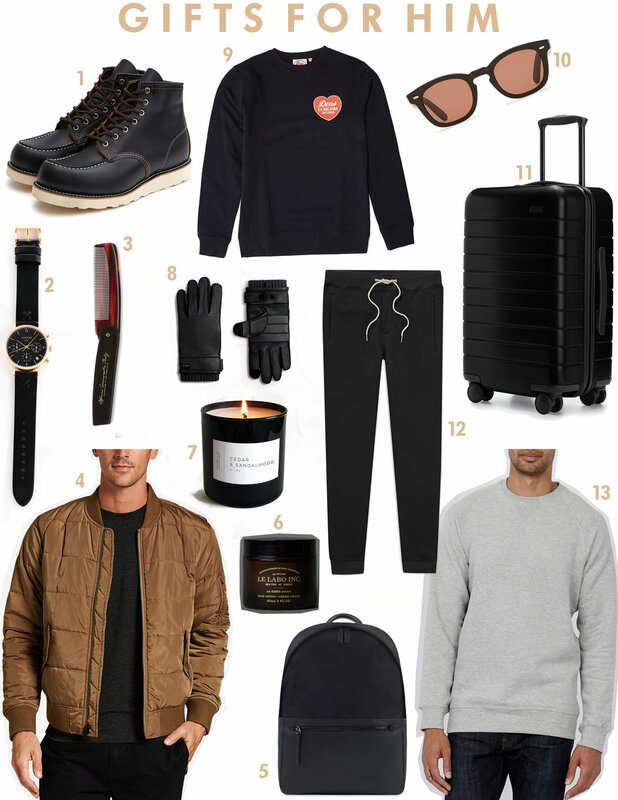 Last week I posted a "GIFT GUIDE: FOR HIM." So naturally, here's a GIFT GUIDE: FOR HER, with everything from PJ's and candles, to fine jewelry artisanal chocolates. Apolis Market Bag | For that girl who goes to the Farmers' Market every week to get kale for her juice cleanses. Elizabeth & James Nirvana Black Candle | For that girl whose apartment always smells like 50 candles are burning simultaneously when you walk in the door. Binchotan Eye Mask | For that girl who keeps up her beauty regime even when she's on a plane. Vintage Pajama Set | For that girl who never seems to have any clothes on when you sleep over. COS Cashmere Trousers | For that girl who thinks "sweats" are beneath her. Gabriela Artigas Mini Tusk and Diamond Earrings | For that girl who has all of the pretty piercings you're jealous of. S'well Yellow Gold Bottle | For that girl who has impeccable skin because she drinks 500 gallons of water a day. Bodum French Press | For that girl who probably spends more money on coffee each month than everything else combined. J. Hannah Jewelry Athena Ring | For that girl who could be a hand model. COS Wool-Cashmere Scarf | For that girl who's always complaining about how cold it is, when it's only 75º. Madewell Lace-Up Hoodie Sweater | For that girl who wants to be comfy but refuses to wear loungewear. Compartes Chocolate Bar Gift Set | For that girl who always asks you to come over and bring chocolate and wine when she's on her period. Zara Leather Ankle Boots | For that girl who wants to live in New York. Zara Beaded Bucket Bag | For that girl who started stressing out about what to wear on NYE in November. 2017 Wall Calendar | For that girl who never remembers the plans she's made.